One of my first posts here on the Wellesley Wine Press featured a 92-point Wine Spectator wine with a release price of just $12: The 2006 Villa Pillo Toscana Borgoforte. 92 points for $12 is a huge Quality-Price-Ratio (QPR) winner; especially for an Italian red. While visiting some wine shops in the metro Boston area yesterday, I stopped in for a visit to Upper Falls Liquors in Newton. The shop is affiliated with Post Road Liquors in Wayland and Auburndale Wine and Spirits (also in Newton) as I wrote here. Their web site is http://thepostscript.com. Anyway, their special this month and last is "buy 6 mixed bottles from the US or Italy and get 20% off". Those are pretty broad categories, so as I walked around I had a few California wines in mind but nothing I *had* to get. Then I asked the friendly clerk if he had any Villa Pillo (because looking through the bins of Italian wine is a mind-bender for me since the labels all look so similar after a while.) He said "Yeah sure- we have it up front." I was like "Wow!". They had 3 cases of it at a price of $12.99 per bottle. I bought 6 for a per bottle price of $10.39. For me, it's this kind of value that makes hunting around for specific wines worth it. $10 is a tough, ultra-competitive price point. There is an ocean of bad wine seeking to make its way into our homes- how else to avoid wasting money on mistakes other than relying on professional critics and trusted local wine shops? Not that I always agree with Wine Spectator ratings, but on average I think they're right more than they're wrong. I haven't cracked open a bottle of this '06 yet, but I did have the '05 and I gave it 85 points. You can read my Cork.com review here. I hope you all have the best Thanksgiving you've ever had this year. Thanks for visiting the Wellesley Wine Press and making it part of your Internet reading! Update (12/2/2008): I cracked open my first bottle of this wine, and I was impressed. It is a very nice wine and it may be worth the hype. I gave it 90 points- read my Corkd review here. I explain why this wine is absolutely the best value I've talked about to date in "How to Buy Wine Like Warren Buffett Buys Stocks"
Question of the Day: If you've had this wine- please tell me what you think. I'll crack a bottle open soon and will update this post with my rating. If you haven't tried this wine, what wines are you serving for Thanksgiving? I subscribe to a lot of wine shop E-mail lists in the metro Boston area. And why not? If I don't like what they have to say, I just ignore it and move on with my day. The thing I like to hear about most in a wine shop E-mailer is an offer for deep discounts on wine the shop is looking to push out the door for one reason or another. Either they've bought the wine in quantity and they've been able to secure a great price, or they're just looking to liquidate a certain wine for whatever reason. I've been receiving Brookline Liquor Mart's E-mailer for about a year and for the most part I've not been tempted to bite on their offers. Mostly because the offers were for high quantities of a single wine, or the terms and conditions of procurement were too ambiguous for me to navigate. As a consumer, there is nothing I hate more the ambiguity- clarity is key. *-I couldn't find a release price for the J Vineyards Pinot. I'd estimate it at $55 given that the 2001 was $50 and the 2006 was $65. One thing I'm always mildly suspicious of is when a retailers compare their sale price to their own "retail", "list" or "regular" price. This tactic gives them the ability to show a seemingly deep discount by jacking up the every day price. To assess whether each of these were truly good deals, I consulted my Wine Spectator Online subscription and queried what the release price was. Not that the price of wine can't change over time, but I feel the release price is a more valid comparison point than the "regular" price. I waited a couple of days after I received the mailer to respond. After doing a little research, it seemed that these were genuinely great deals. Not only that, they were appropriately timed to the season (Thanksgiving is just around the corner and Riesling and Pinot Noir are perfect wines for this time of year.) Further, the Brunello included in the offer was a 90 pointer and deeply discounted from release price -and- already aged the 10-years that Brunellos are recommended to be cellared. What a deal! I was unsure whether ordering a wine listed as "SOLD OUT" would qualify me for the deal, but I wanted to get the other wines at a good price without ordering too many wines, so I included the Brunello in my order in hopes that it would. The J Pinot and the King Estate Pinot showed as being in stock, so I ordered (2) of the J Pinot, (2) of the King Estate Pfeiffer Pinot, and (2) of the Brunello. I called up Eden Stone straight away and she said she'd refund the money for the shipping and I could come pick it up at the store. I haven't seen a credit back on my credit card, but I assume it'll just take a little time. So today, I drove down to the Brookline Liquor Mart to pick up my 4 bottles. I gave my last name at the counter and while they were poking around trying to find my orded I had a look around the shop. I spotted the J Pinot on the floor for $24.97 (which contradicts the verbage in the offer saying that "these wines are not available in the store".) The reason I was looking for it was that I forgot which wines were shipped and thought that perhaps there might be some remnant bottles on the floor at the same price. I thought to mention this point here in the blog because the J Pinot was one of the best Pinots I have *ever* had at any price. Read my Corkd review here. I gave it 93 points and at $24.97 that makes for an awesome QPR (for a Pinot Noir which is perhaps the highest priced domestic varietal.) I'd highly encourage you to seek this wine out and the pricing at Brookline Liquor Mart surely can't be beat on this item. In summary, I'd say it was an interesting interaction with Brookline Liquor Mart's Internet Sales/E-mail offer. I'm certainly pleased with the first wine I cracked open and I hope the Brunello is just as good. In the end, it's the enjoyment you get out of the wine in exchanged for your hard earned dollar that determines value. And overall this transaction is looking like a good value. Question of the Day: Do you do a lot of these "order online, pick-up locally" deals? Or more straight Internet and ship wine transactions? Some of my first entries on this blog were dedicated to a class of wine gadgets known as aerators. Wine aerators are designed to rapidly "open up" wine and give it more desirable aromatics and smoother flavors. Traditionally, this is achiveved by decanting- a process where you pour the wine into a vessel that exposes as much of the wine's surface area to air as possible in an effort to aerate the wine more rapidly than it otherwise would. Within the last 5 years a class of products have emerged that claim to accelerate the process of decanting such that you decant "on the fly" on an individual serving basis. Two in particular that I focused on were the Vinturi (review, interview) and the Soirée (review, interview). The wine I chose for this tasting was a 2005 Caronne Ste. Gemme. It received 91 points from the Wine Spectator, and was highlighted as one of their "Smart Buys" with a release price of $17. I chose the wine for this tasting because I felt it would be a good test wine for the aerators and for decanting in general. Red Bordeaux is one of the few varietals widely accepted as being age-worthy, but at the same time those of us who are impatient -or- want to sample young Bordeaux to assess whether we should buy more find reason to crack open a bottle before it's time. A good ballpark in general for cellaring Bordeaux is 10 years. At 3 years old we are drinking this wine very young. 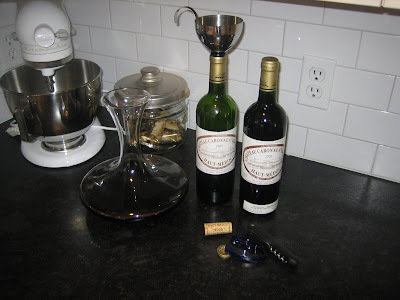 According to James Suckling, Spectator's chief Bordeaux taster, this particular wine should be best after 2011; hence the need for decanting or aerating. We then took notes on our preferences and rank ordered the wines 1 through 4 with 1 being our favorite and 4 our least favorite. "The Soirée is a Better Product than the Vinturi"
Averaging the scores certainly does show that the Soirée outperformed the Vinturi, and the Soirée was the favorite wine of 2 our of 3 tasters. I will certainly perform this tasting again with a different wine and different guests. "You Guys Don't Know What You're Doing"
The fact that Pop 'n Pour on average outperformed the decanter was surprising. Going into the tasting, I was expecting the Decanter to be 1st, Pop 'n Pour to be last and the two instantaneous aerators to be somewhere between. However, the results weren't aligned in this manner. 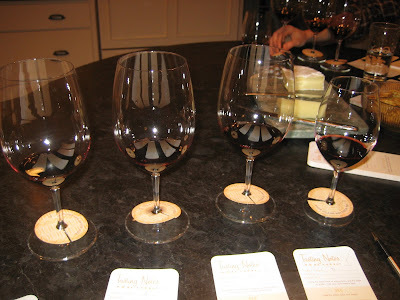 Each of us did indicate noticable differences between the wines being tasted (though the difference wasn't extremely pronounced in my view) so we know that we were at least perceiving differences between the products. Whether we like the results or not- they were the observations made by real people and likely the kind of people you'd have over to your house for wine, so for me these observations are perhaps more meaningful than any expert analysis could be. "Wine Gadgets Don't Work Very Well"
I'd like to thank my two guests that night for their enthusiastic participation. Having multiple opinions really makes the results more illuminating I think. Here's a link to a 7-Way Blind Aerator comparison I did after completing this piece. Question of the Day: What do you think of these results? I've been quite impressed with this wine in tastings, and it's tough to find a nice Pinot Noir for less then $20. Finding even a "good" bottle for $16.79 was reason enough for me to pick up a couple of these for the holidays. Aunt Sarah loves Pinot, and I do too- especially this time of year. Something about the varietal says "harvest" to me. I've previously mentioned this one on a number of occasions. First, in general praise of the wine and second to acknowledge its making the Top 10 of Wine Spectator's Top 100 list for 2008. I don't know what's more amazing: A delicious 93-point California red wine for a release price of $24, Costco having it for $16.79, or the fact that they still have some remaining. At this price, you must buy this wine! I was really impressed with this wine at The Hingham Wine Merchant's Holiday Wine Show, but I was already planning on buying a bottle of Honig Bartolucci Cab so I held off. When I saw it at Costco at this favorable price, I had to buy a bottle. This *is* premium Napa Cab. It definitely impressed in the tasting, and at this price point I look at the whole package. The freakin' bottle is like 4 pounds and has a punt you could hide a golf ball in. Big time stuff- I'll be saving this one for a special occasion for sure. By the way, there's an ongoing thread in the WineSpectator.com Forums with the same title as this blog entry where people across the country post wine deals they see at Costco. I noticed a couple of other non-wine items I thought to mention. An 8GB iPod Touch for $219 (review, retail is $229) and a Flip Mino pocket Camcorder for $144. Good prices on these great products. Question of the Day: Any good deals at your local Costco you'd like to share? If not, are you a fan of Costco in general? Why or why not? As I mentioned in my prior video review, the good folks who make the Soirée Wine Aerator were very accommodating of my requests. Andrew Lazorchak is a really great guy and he was nice enough to spend some time talking on the phone with me about the Soirée. Here is an interview I did with Andrew. First off, thanks so much for the samples and thanks for taking the time to discuss the Soirée with us consumers. I really appreciate it. Q: What is your role at Soirée? Andrew Lazorchak: Bob, it is really our pleasure. As you would imagine we are happy to have your review of the product, and we are excited to see how the head-to-head with Vinturi goes. Your examination is thorough and we are glad to take this opportunity to delve into the product. I am the Managing Director at Soirée. However, I am one of three partners who all helped craft the Soirée. My partners are Patrick & Coleen Costin. 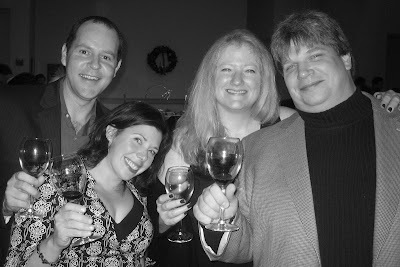 We are long time family friends who were brought together by our passion for good times and wine. As a team, we have constructed every piece of the brand and the product. My role is a little bit of everything. From design, graphics, marketing, order placement, fulfillment, website design, team development….you name it – I am involved and I love it. Q: Who invented the Soirée? Andrew: My partners and myself all lent a hand in the generation of Soirée. As mentioned above, we spent many hours around the cellar bar or the kitchen table, and then one day we found ourselves designing a product, a brand, and an element that would all bring us closer to the world of wine. The Soirée was developed for 1.5 years, where we celebrated late nights of vino (Aka “product testing”) and development. And eventually, after many shapes and sizes, we arrived upon the Soirée. Honestly, we had so much more built into it as a concept. But we learned quickly that there is only so much you can do with glass, and more importantly, that wine only needs so much massaging to wake up. Q: As I showed in the review, one of my samples broke because the green neck that holds the Soirée when not in use came loose from the base. If that same thing happened to someone who bought a Soirée, how would you handle a warranty replacement? How would you recommend customers contact Soirée for something like this? Andrew: Great question. We always support our retailers, their customers, and our direct sale customers. Anyone that contacts Soirée with a quality issue, we look to take care of them straight away. Soirée will gladly send a replacement product assuming the claim is fair, after all they are glass and you do use them while drinking. But we do pride ourselves on our customer service and help out our customers and supporters whenever possible. The best way to contact us is by emailing us or using our contact form on the webpage. The main mailbox is info@winesoiree.com and our phone is 1-888-5-Soiree. We welcome people to call us but that number is primarily set-up for our vendors to place orders. And in response to the loose green neck you experienced; the way the base is assembled you can unscrew the green neck from the plastic base. It does have a tiny bit of glue to keep it in place. But on a rare occasion, the neck will become loose during shipping. It simply twists back in like a light bulb and should stay securely in place. Q: In my video review, you can see I had some trouble understanding how to use the additional gasket with a screwcap bottle with a larger than standard enclosure. I think I figured it out since however- I'm supposed to attach the additional gasket to the Soirée and *then* stick it in the bottle, right? Well first, I will note that every Soirée is packaged with an insert card with basic use and care instructions. We do review the gaskets in our instructions, but we know that the extra piece can be mis-leading. We’d like our customers to know that we have received phone calls where we help explain the product and how it works with people, and that is great by us. We enjoy hearing people's experiences with their Soirée, we learn a lot from those interactions. You know, it is really awesome when someone calls you and just raves about your product. Not that it happens all the time, but recently it did. I got to talk with a wine enthusiast for an hour about their experience with Soirée, and my thoughts and their thoughts and on and on.... Point here is, don’t be afraid to contact us with questions, we look forward to speaking with you. And one side note when interchanging the gaskets the gaskets can sometimes be hard to remove. If the gasket you have on the Soirée is really tight, just get it wet. Once water gets between the glass and rubber, the friction seal goes away and the rubber gasket will slide right off. Q: What kind of wineries have been particularly receptive to the Soirée? Any region or varietal where the Soiree is particularly well suited? Andrew: Well that is a good question, as I never thought of it in that way. I'd say that the wineries and vineyards that carry the Soirée and feature it in their tasting rooms, have one common thread they are "Good People". Seriously. The people who have tried the Soirée are typically more open-minded and willing to drop their preconception of how wine should be served or if it can be enhanced by “gadgets”. And I'd say that 80% or more of the people that try Soirée love it and become quick fans of the product. Yet of course, there are a few "Doubting Thomas' " and "know-it-all wine lovers" out there, and we appreciate them for that, as it keeps us on our toes. But does Soirée thrive per grape varietal or region? I do not think so. We see sales from Upstate New York to Georgia to California , and many places in between. And we are international, with distribution in Australia , and the EU this November. So the Soirée works with a lot of the different varietals, and with wines from most regions. But for the sake of generalizing, Soirée is great for mellowing out wines that are tightly crafted, have lots of structure, or just need a little help "stretching out". Further, Soirée is good for dispersing the "hot" alcohol burn that can come with wines from hotter climates. Reds are great with Soirée. Reds just have more to them and need more help opening up. And for the record, the Soirée is not about a single variety or region. The best bet is to just try the Soirée. Try it on a Chardonnay, Sauvignon Blanc, Rose, and of course all the reds. You will see bouquet enhancement on whites, depth added to young wines, and your big boy reds; they will be "unleashed" with their flavors, nuances, and aromatics enhanced in a gentile and surprising manor. I always encourage people to do a taste test with every bottle. Simply pour some wine straight from the bottle into a glass, then pour a second glass through the Soirée. Then taste, see what you notice...that is the fun of wine...to explore what is has to offer...or the story it will tell. Q: What is the best way for our readers to purchase a Soirée online? Andrew: Well if there is no retailer by you, please visit our online store. ( https://app.fastshoppingcart.com/index.jsp ) We also have retailers who sell Soirée online, so please feel free to shop around. Q: What is the best way for our readers to find a local retailer who sells the Soirée? Andrew: To find a retailer in your neighborhood, check our list of retailers. ( http://winesoiree.com/currentRetailers.html ) And when you visit that store, feel free to let them know you came there looking for the Soirée. Q: What is your favorite part of Soirée? Andrew: First off, I’d like to say Thank You again for this opportunity! There are so many aspects of Soirée that have been a blessing and treasure. What grabs me most is the ability to interact with the wine trade and people who enjoy wine. To get to know the trade is to hang-out with a lot of kind people who celebrate their passion for art in the form of winemaking. Truly, the wine makers, vineyard owners, and wine reps all share a unique bond and camaraderie in their labor, it is usually a welcoming scene and good-natured people. At the same rate, it is priceless to be able to talk directly to the fellow wine appreciator. Most wine drinkers enjoy learning more about wine, and to discuss view points and opinions. I really like the opportunity to share the Soirée and illuminate the common oversight of the average wine drinker. Most wine drinkers admit they do not decant their wine or reserve decanting for fancy bottles. This commonality makes it a great opportunity to demonstrate Soirée and receive the "Wows" when people see how easy and affective aeration is for wine. It's a great job! We get to expand the understanding and enjoyment of wine. And at the same time, we have the opportunity to offer people an easy, affordable product that does just that - enhances wine enjoyment. Thanks a lot for your time Andrew. I wish you luck with the Soiree and in all you do. 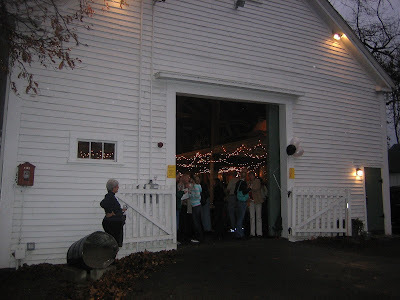 "Don't Open a Shop Unless You Like To Smile"
Rochelle and Scott Wagner celebrated the 1st Anniversary of The Wine House with an awesome tasting at The Holliston Historical Barn last night. I had a chance to drop in and it was evident in the time I was there that they both understand the meaning behind the Chinese Proverb cited above. They were all smiles while referring to their customers by name, making sure everything ran smoothly, and having a good time alongside those who have made their first year in business a success. Judging from the wines available for sample, it would appear that The Wine House focuses on expanding the palates of their customers by exposing them primarily to reasonably priced wines ($8-$30) from top regions in the United States and around the world. A good recipe for success if you ask me. Maybe it was because I read Wine Spectator's issue on "Great Reds from Spain and Portugal" before leaving for the show, but I thought those areas were particularly well represented and I ordered a few of bottles from those regions. I also enjoyed trying some new things- a white Bordeaux, some Australian Port, and white blends from around the world. Oh- and I especially appreciated Scott mentioning to me that Ruby (one of the distributors at the show) was pouring some Altamura Sangiovese that wasn't on the list of wines for tasting (a secret extra wine!) Scott noticed (and remembered) my mention of the Altamura as one of my favorites from a tasting I went to last week- now that's personalized service! I'll always associate Hollison, MA with being the home of John Cooley of ESNUG fame. A rare crossover between this wine blog and my full-time job. The venue was really cool. Rustic but comfortable. Festively attended but not annoyingly crowded. The people who attended the event were polite and friendly. I've run into some rather rude types at wine tastings in the past so it's nice to see that nice people shop at The Wine House. It's not a bad drive from Wellesley to Holliston, MA. An easy shot (about 20/25 minutes) out Route 16 through some nice towns. Q: The Vinturi is a device that you hold in one hand while you pour the wine with your other hand. Some other wine aerators attach to the bottle (for example the "Soiree" and the "Nuance Wine Finer"). Why did you decide not to have the Vinturi attach to the bottle? Rio Sabadicci: In order for wine to pour out of the bottle, air has to go in. Plugging the bottle would prevent wine from flowing freely and we wouldn’t be able to achieve anywhere near the level of aeration we do. This is evidenced by the Menu aerator. They have a great design but forgot about air going in the bottle so their product just anemically glugs glugs a little wine. The last thing I want is a thin glass globe sticking out of my wine. You turned the bottle upside in your video. What if the device slipped - it’s a disaster waiting to happen. Is it pronounced “Sorry”? That product is less effective than pouring wine into one glass and then another. I can’t believe some of the things wine drinkers fall for. One of the reasons Vinturi is so effective is because it’s not stuffed in the neck of a bottle. Q: I've had great results using the Vinturi with young Bordeaux, high alcohol content Aussie Shiraz, and tannic Napa Cabs. I even use it with white wines like Chardonnay and it seems to work well. Are there any wines that you woudln't recommend be aerated with the Vinturi? Rio: We recommend pouring a taste with and without Vinturi and drinking the one you prefer. We just want you to enjoy your wine. However, nearly all Vinturi owners use Vinturi nearly all the time. I prefer Cabernet and Chardonnay and can’t comment on the others. Q: I've noticed is that if I leave the Vinturi out overnight without rinsing it that dried red wine remains in the aeration chamber. How would you recommend removing the dried red wine? Rio: Either rinse under warm water or use your dishwasher. The Vinturi, stand, and pouch are all machine washable. If your detergent leaves a white residue, rinse it off under cool water. Treat the Vinturi the way you’d treat a wine glass. Q: Some wines have sediment in them. How would you recommend such wines be filtered in conjunction with being aerated through the Vinturi? Rio: Someone who has cared enough to keep a bottle of wine around long enough to throw sediment probably has their own solutions. The options are to pour carefully, decant into a container first, or use a strainer above Vinturi. Q: Is the Vinturi Wine Aerator your only product? If so, do you have plans for creating other wine aerators or accessories at this time? Rio: We’re working on new wine products as well as accessories for the Vinturi. I won’t release a product unless I’m thrilled with it, so I don’t know when new inventions will hit the market. I think it’s safe to say that you can expect at least three new things in 2009. Thanks for your time, Rio! If you're interested in the Vinturi Wine Aerator, you might be interested in this video review I did of it, as well as this head-to-head blind tasting that included the Vinturi. Question of the Day: Are you planning to buy a wine aerator soon? If so, which one and why? About a month ago, I heralded the Seghesio Sonoma County Zinfandel as a super-value red. On Monday of this week as part of Wine Spectator's annual Top 100 unveiling, it was announced that Seghesio's high-production garden-variety Sonoma County Zin was one of their top wines of the year. Quite an achievement for such a mass-produced wine and a Zinfandel of all things which is not the most prestigious varietal. Good call by Spectator I say. It should be noted that this list is *not* a list of the "best" wines of the year- that's easy enough to calculate by searching their database and sorting on score. Rather, this is their list of "now" wines- the wines that really stood out for the past year. I think it's interesting. I'm not sure whether this will create a spike in demand for the '07 Seghesio but I will be more likely to pick up a couple of bottles than I would have been otherwise. I recall how the market moved on last year's #1, the 2005 Clos des Papes Chateaufeuf-du-Pape once announced. At release it was 98 points/$80. Last I saw it in a wine store it was $250 which makes $80 seem like a bargain. It would've made a good wine to lay down for my 3-year old (who was born in '05). Have a look at historical WS Top 100s here. Update: The #1 Wine on this year's list was the 2005 Casa Lapostolle Clos Apalta Colchagua Valley with a release price of $75. Question of the Day: Do you pay any atention to this list? Or do you think it's a bunch of nonsense? This was the 3rd Hingham Wine Merchant event I've attended, and I've enjoyed each of them very much. They're a great night out and a nice way to buy a bunch of wines after getting a chance to taste them first. Last year's Holiday Show was a little crowded for my taste and the crowds were much more manageable at this new venue (The South Short Music Conservatory). The food was good, but I didn't get much of a chance to partake being all preoccupied with getting around to sample the wines. Best wine I tasted, but again- too spendy for me. I've been eyeing this one a while and it *was* impressiveToo cheap to spring for it though. I was really surprised how good this one was. Tasted this one with interest since Deanna bought me the '04 for Christmas last year. Thought this one was quite closed and pricey. Went big on this one. It impressed in the tasting; hope it is a great bottle. Possibly the most aromatic wine I've ever come across. I can't seem to keep enough Pinot in the house this time of year. Big fan of this one. Best Napa Cab < $40. Said to be the new wine by the guy who started Sanford. The neighborhood in Hingham you drive through to get to the Conservatory is snazzy. I think Sean has been a great addition to the team at HWM. Scott Weinstein of Martignetti is great at what he does. Question of the Day: If you attended the event you've gotta leave a comment and stop the lurking. If you didn't attend the event- any comments on my picks? One of the my first entries on the Wellesley Wine Press was a video review of the Vinturi Wine Aerator. In the comments section Heath Stone noted that he'd seen a competing product, the Soirée Wine Aerator, in prominent use at Oregon wineries. When I heard this, I knew I had to go out and procure one of these so I could test it out! I contacted Soirée at http://www.winesoiree.com and within hours I was contacted by Andrew Lazorchak, one of the principals at Soirée. Great guy. We talked for a while and Andrew agreed to send me a sample of the product so I could do a review. I have to say- I was really impressed with Andrew's responsiveness to my inquiries then and since. Now *that's* how you run a successful business! In a future post, I'll be doing a blind tasting which seeks to answer the question: "Which wine aerator works best?" Click HERE to read an interview I did with Andrew Lazorchak after compiling this review. 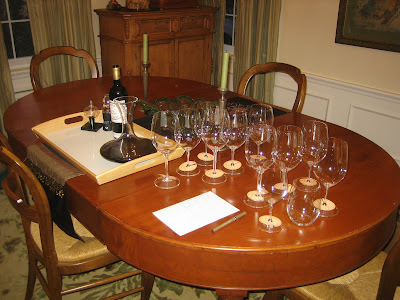 Click HERE to read about a 4-way blind tasting we performed comparing the Soirée to the market-segment-leading Vinturi, traditional decanting, and pop 'n pour. Click HERE for a 7-way blind tasting which compares the Soirée to 5 other instantaneous wine aerators and pop 'n pour. Question of the Day: What do you think of the Soirée? If you have any questions about the product please leave a comment- I'm planning to have a follow-up interview with Andrew Lazorchak from Soirée soon. The Hingham Wine Merchant's 7th Annual Holiday Wine Show is slated for this coming Saturday, November 8th from 6:30PM-10:00PM. This event is open to existing Wine Merchant clients only; RSVP and pre-payment is required. That being the case, I'm posting this notice here as a service to attendees who may have misplaced their E-mail with event details. I attended this show for this first time last year and I really liked the concept. You get to taste up to 200 wines with all important varietals represented and unlike a tasting event like the Boston Wine Expo, you can actually buy all of the wines you taste and even better- at special event pricing. Pair the Wine Merchant's high standards for the wines they carry with their gourmet sensibilities and you've got a great night out! The store typically has event-purchased wines packaged and ready for pick-up a week or so later which makes this a really convenient way to stock up on wines for the holiday season. The event is at a new venue which promises to be less crowded than last year and the previous two-session format has been replaced with one session. I think this is a good call- last year we attended the later session and found that 1st session hangers-on couldn't bare to leave which made for a very crowded session especially early on. If you're planning on attending the event, please leave a comment below and I'll look forward to seeing you there. If you're a Wellesley Wine Press lurker and you happen to see me there and say "Hey- you're that guy from the wine blog!" I will be truly humbled. I'll follow-up after the show with a review.